Tallinna kunstihoones saab näitusel "Vaikne revolutsioon" näha joonistamiskunsti. Kunstivõõrale inimesele võib tunduda kummalisena, et varem galeriisid täitnud hiiglaslikud maalid on nüüd tihtipeale asendatud näiteks videosalvestustega. Tehnika areng on loonud kõik eeldused selleks, et tänapäeva inimesele ikka ja jälle midagi uut ning jalustrabavat pakkuda, vahendas "Aktuaalne kaamera". "Näituse mõte on populariseerida joonistamise meediumit tänapäeva kunstis ja üldse Eestis ning juhtida tähelepanu sellele, et joonistamine on kasvav ja arenev ja trendikas nähtus tänapäeva kiiresti muutuvas ja pisut ka hektilises maailmas," rääkis näituse kuraator Anu Juurak. Joonistamise tagasitulekut sõltumatu meediumina on kunstimaailmas kutsutud "vaikseks revolutsiooniks." "Joonistusi saab kasutada väga mitmel moel. Joonistamine on inimese jaoks üks esmaseid keeli. Kõik oskavad joonistada selle ajani, kui nad lähevad kooli. Me paneme selle keele lihtsalt taas maksma," selgitas kunstnik Dan Perjovschi. New Yorgis elav ja töötav Eesti kunstnik Jaanika Peerna on pöördunud tagasi lihtsuse ja tagasihoidlikkuse juurde. Näitusel esineb ta videoga, mis kujutab juhusliku valguse peegeldusi joonistusel. "See on mõni aasta tagasi tehtud töö ja sellel on minu enda joonistus, kus mängib valgus. See on täiesti juhuse mõjul leitud hetk, mida ma filmisin oma ateljees New Yorgis," rääkis Peerna. Näitus on avatud 9. septembrini. Tallinna Kunstihoones näitus "Vaikne revolutsioon / Silent Revolution"
31. juulil avatakse Tallinna Kunstihoones näitus "Vaikne revolutsioon / Silent Revolution". Tegemist on Tallinna Joonistustriennaali kuraatoriprojektiga. Klassikaraadio stuudios näituse kuraator Anu Juurak. Does an artwork, a drawing, ask questions? How, and why? What are the expectations of an audience to drawing-based art? or does this event remain inside the art-circles? Drawing is part of the thinking process just like writing: an intellectual pursuit. We think that it can evolve into an exchange of ideas. The Fourth Drawing Trinennial has set this as its main purpose: drawing that usually serves as artist’s tool, has a potential to become more than that. While doing the drawing, artist is in dialogue with people, texts, environments and other artworks. A drawing can be seen as an artist’s monologue, but it can also evolve into a multiple dialogue. Without the audience, artwork is meaningless. The audience should make an intellectual contribution to this dialogue as well, or a conscious attempt to understand, to cooperate. The dialogue can be barred because of a lack of attention or knowledge, because of inadequate skills or time; because of ambiguity or misconception. Why do some people avoid visiting exhibitions? Is this avoidance caused by lack of interest or by fear of misunderstanding the language of art, or perhaps by fear of facing inconvenient issues? How can one start and manage a dialogue at an art exhibition? Artists use certain techniques to challenge the audience. There are possibilities of organizing meetings with artists, lectures, excursions, workshops and other educational events. Sometimes the public is involved in the creative process. The dialogue could take place immediately, or later, or over some time. Does a successful art exhibition make people think, does it open up new issues, or inspire creative thinking? Should the ideas be discussed in the press? Should the feedback of an exhibition be published, or perhaps the intellectual effect of an exhibition might be more latent, reflecting in the thoughts of people, influencing their futher activities? Can art be like journalism? Who needs art: the artists, or the audience? What are necessary conditions for the survival and development of drawing medium? We expect answers to these questions from the curators and artists who take part in the Fourth Drawing Triennial. The return of drawing as an independent medium, that started from the 1960s, has been called „silent revolution“ . The concept of sketching and outlining an artwork (before executing it in a „noble“ technique) was overthrown by this. The change has placed the method of drawing on a central position in deconstructing artwork and exhibition; it has shown another way for understanding art. Artists have always appreciated the fact that a drawing is never complete, that it expresses a process. We live in an era of undetermined change. 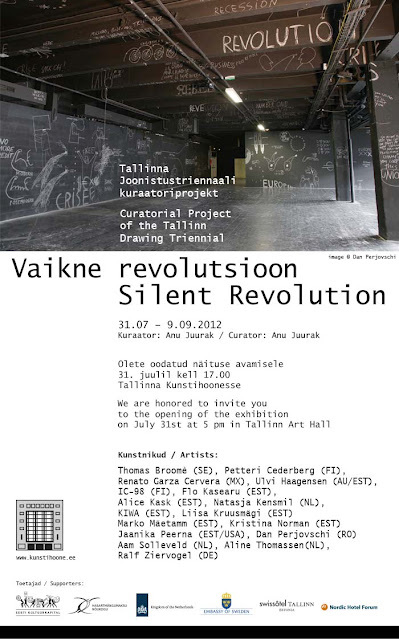 The exhibition „Silent revolution“ discloses some expectations and hopes in the society, it analyzes and demystifies some psychological and semiotical mechanisms.